Green pond water develops is caused by floating algae and occurs especially in newly sunk ponds containing water that is rich in food. They develop like lightning. Except that the pond water will turn into a green mass, a nasty phenomenon is that the growth of your oxygen producing plants will stagnate. The tiny algae are floating separately in the water. Their numbers will increase explosively and give a green colour to the water, as a result of which you can hardly see any fish on the bottom in the end. Additional effects are a low CH value, a high pH value and stagnating growth of oxygen producing plants. 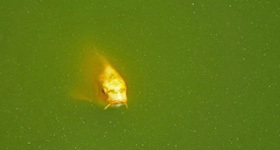 How can you fight floating algae or remove them from your pond water? Apply pond plants: Sink more pond plants which, which for their supply of CO2 do not depend on water (floating plants, water lilies and marsh plants). Cover 30 to 40% of the water surface with plants, so that they will absorb the nutrients present whereas algae do no longer stand a chance. Inspect the pond water with a pond test kit: an ideal GH value will range between 8 and 12° GH. If necessary, bring hardness to the level. Activate micro life applying means to this end. Apply a sufficient amount of bottom substrate in order to activate micro-organisms. The pond water will be clear again after about 2 months. A permanent solution to prevent your pond from having green water is a UV-C filter, ultraviolet radiation kills floating algae, germs and fungi. Result is crystal clear water and a healthy pond environment for fish and plants. The UV-C lamp, which allows to remove the algae, goes along for about a pond season. Replace the lamp every spring for a lasting result.